We’re always on the lookout for recipes that are great desserts to bring to a party or barbecue. As soon as I saw this one on the Food Network with Giada De Laurentiis, I knew we were going to have to give it a try. It combines a couple of things that everyone really loves – brownies, caramel and chocolate chip cookies. I have seen this dish called a few different things, but Giada called it Magic Bars. The real magic part about them is how fast they disappear. Position a rack in the lower third of the oven and preheat the oven to 350 degrees. Spray two 13 x 9-inch baking dishes with cooking spray. Line each dish with a 15-inch square of parchment paper, allowing the excess to hang over the sides. Spray the parchment paper with cooking spray. For the brownie layer: In a large bowl, blend together the brownie mix, vegetable oil, 1/4 cup of water, espresso powder and the eggs. Using a hand mixer, beat for 1 minute on medium speed. Pour the batter into one of the prepared pans. Bake until a toothpick inserted about 1 inch from the edge of the baking dish comes out clean, about 25 to 27 minutes. Transfer the pan to a wire rack to cool for 1 hour. Using the excess parchment paper as handles, lift the brownie layer from the pan. Run a thin spatula underneath to loosen it from the parchment paper. Keep the oven turned on. For the cookie layer: In a medium bowl, whisk together the flour, baking powder, baking soda and salt. In a stand mixer fitted with the paddle attachment, beat the butter and sugars in a large bowl until fluffy. Beat in the vanilla and egg. Add the flour mixture and beat until a dough forms. Stir in the chocolate chips. Using your fingers, press the dough evenly into the bottom of the other prepared baking dish, leaving a 1/2-inch border. Bake until it is light golden, about 14 to 16 minutes. Transfer the pan to a wire rack to cool for 30 minutes. For the caramel: In a medium, heavy saucepan, combine the caramel candies, 2 tablespoons of water and vanilla over medium-low heat. Cook, stirring occasionally, until the candies have melted and the mixture is smooth, about 10 minutes. Pour the caramel evenly over the cookie layer. 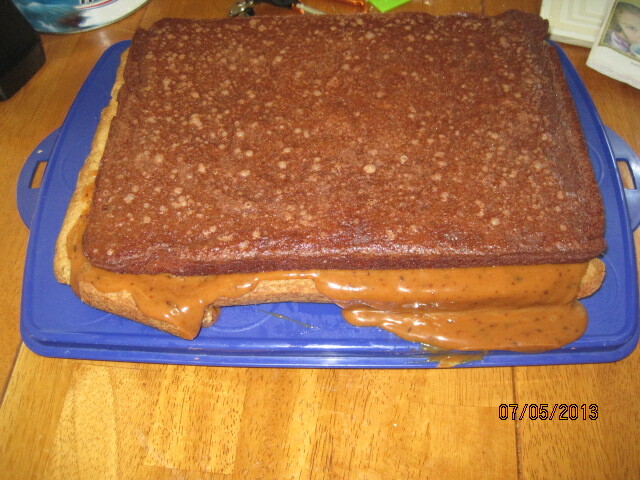 Working quickly, place the brownie layer on top of the caramel. Gently press the brownie layer into the caramel. Refrigerate for 1 hour until the caramel has set. Allow the layers to come to room temperature, about 30 minutes. Cut into 24 bars and store it in an airtight plastic container. The original recipe calls for some shredded coconut over the brownie layer and a cup of chopped walnuts in the cookie layer, but we omitted both since we were bringing it to a party and we weren’t sure if there were any dislikes or allergies involved, so we kept it simple. Everyone seemed to love the dessert and you got the best of both worlds with brownie and chocolate chip all in one. Michelle thought the caramel could be a little smoother and suggested added some heavy cream next time to the caramel to smooth it out some more. No matter how you decide to make it, it is very easy to do and tastes great. It’s definitely a good one to remember for a party. That’s all I have for today. Check back again to see what other recipes I’ll be using in the coming days. Sean has been picking out some recipes he wants us to try, and this week I think we are going to make things like pulled pork sliders, Cobb chicken salad sandwiches, barbecued chicken and we are even going to try our hand at making some bagels. Check back and see how it goes. until then, enjoy the rest of your day, try to stay cool and enjoy your meal!